BONANZA! 's tagline used to be "A very important show about nothing in particular." Just Matt Alexander and Myke Hurley sitting in front of microphones discussing whatever came to mind. Recently though, they have pivoted to discussing Myke's upcoming wedding. On the main project page, I talked about challenge of designing the stained glass windows, and basing them on the artwork of RelayFM shows. But deciding on a subject for the window designs wasn't the end of the process. I started with the colours. I went through all of Relay's shows, both current and retired, and recorded the colours present on the artwork. 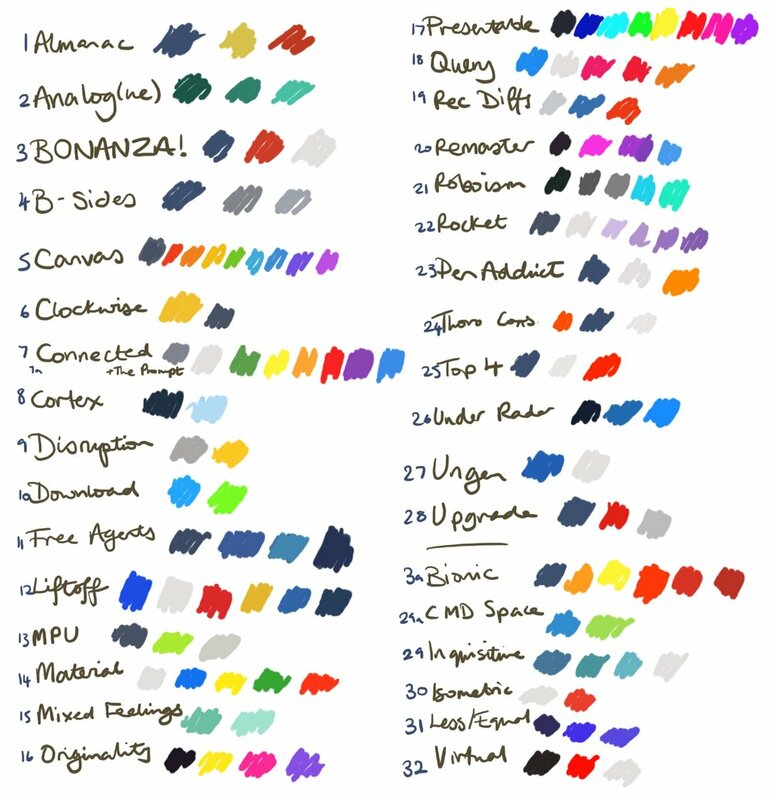 Corel's dropper tool doesn't work on anything outside the drawing window, so these are all estimates. After compiling the list, I went through to see which shows use similar colours and so could be the same window. I already knew the number of windows I had, and wanted to represent as many shows as possible. It was at this point that I decided to make the designs versions of artwork, as opposed to using the colours in other shapes or designs (whatever they may have been). I also had a rough idea of windows would be together on the elevation. Artwork colours on RelayFM shows. My initial colour and show crossover ideas. Then I started work on the actual designs. I copied the window shapes from the actual drawing; at this point Version 1 was complete except for the windows themselves. I labelled them with the shows and copied the colours over. The single rainbow window was the simplest. I knew I wanted a rainbow and already had the design, so all that was involved was choosing the exact colours, a mix of Connected, Presentable and Robosim. The only window, of the main ten, not directly influenced by a podcast's artwork is the Bionic window. The design of that window is inspired by both the Vlcnr discussions on Bionic and my Volcano Thumbtacks drawing, based on a BONANZA! episode. There are only two crossover windows in the final designs, the others are all based on a single podcast's artwork. The Disruption/Clockwise window, second from the left at the top, is one. The other is one of my favourites, bottom right, Rocket/Remaster. I love how the dome and mountains of the Remaster artwork fit with the rocket of Rocket. My other favourite is Liftoff, in the middle of the top row. I was sad to lose the top row of windows in the second version. But the rainbow colours chosen for the glass roof are also from a Relay show, Canvas.